Do you have an old or dated fireplace or mantel? Nothing says welcome home like a hearth. Especially in the winter. And definitely in New England. If you live within a one-hour drive of New London, CT, we can help. 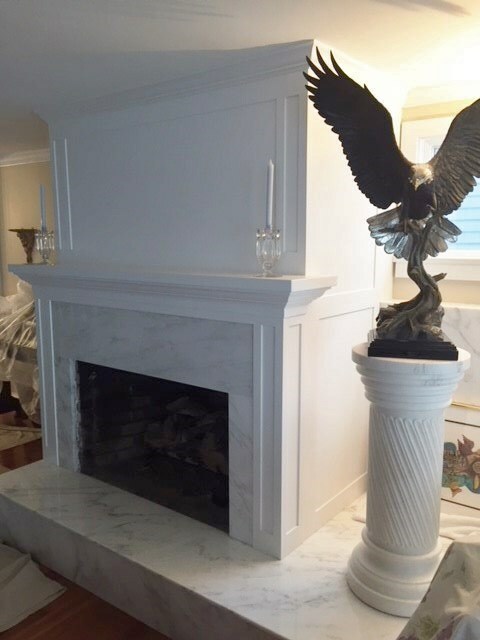 Master craftsman Art Sylvia has been carefully creating new fireplace surrounds and mantels for decades. And he loves it. He is meticulous and does careful, quality work that many of our clients absolutely love. You can too. 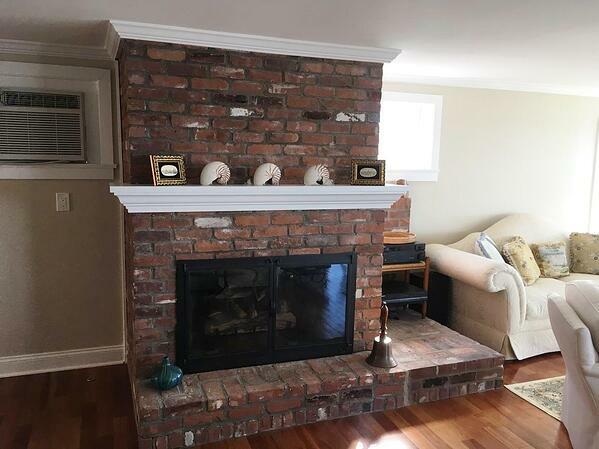 This renovation project started with an older brick fireplace. When it was originally built, it probably looked great. Not anymore. It looks dated and out of style. It doesn’t fit the homeowner’s design scheme of the 21st century. Art patiently met with the clients to learn exactly what they were looking for. He offered options that met their needs. And then he went to work. Carefully selecting the wood. Meticulously planning his process. Game on. Measuring. Re-measuring. Jointing. Cutting. Carefully fitting. Clamping. Gluing. 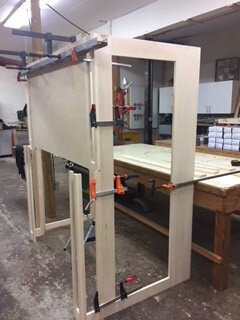 First the basic frame components. Then the precise detailing. Then assembly. Need your project painted or stained? We can do that, too. 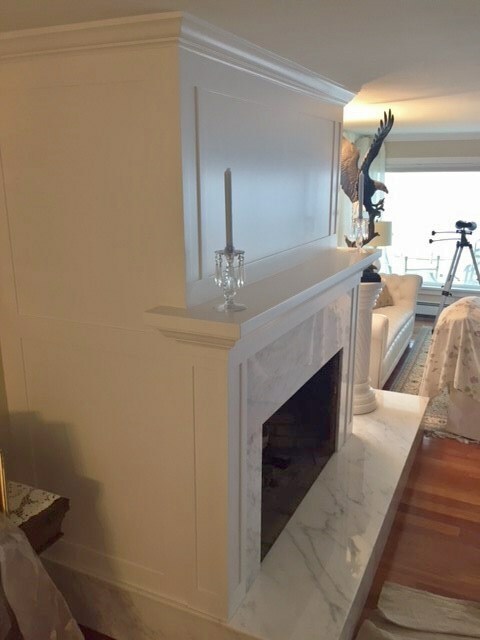 This client wanted their custom fireplace surround painted. We hope you enjoyed this article. 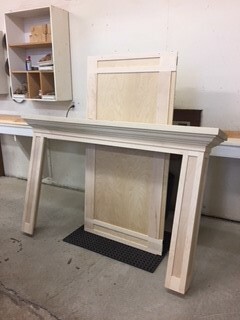 Please CONTACT US if we can help you with a custom fireplace surround. Bring in all your goodies, because we want to know what you are looking for. Magazine clippings, sketches, any ideas or ‘must haves” are great. The more you know about what you want, the easier it is to help you get there. If you like us, and think we may want to work together, please invite us over to your place. We will schedule an appointment to come visit your home. Please don’t worry about any clutter or mess – that actually helps us get an idea of your possible need for additional storage. We’ll take some measurements and learn more about your hopes and dreams for a new kitchen. And they lived happily after. 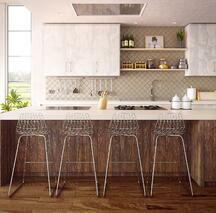 Trends come and go, and kitchen design is no exception to the ever changing rules of style. Today we're sharing a few hot kitchen design trends worth following as illustrated in this stunning kitchen renovation (see photo). Bi-Color (AKA Two Tone) Cabinets: Painting base cabinetry and upper cabinetry in different colors adds interest to kitchen cabinetry. Consider this concept during the kitchen design process if you have a small kitchen because it visually expands the room. Tall cabinets that reach the ceiling painted the same color will make the space appear larger still. Gold: Donald Trump and Mr. T rejoice; brass and gold are back. Gaining popularity in small doses after a long shutout from kitchen design, gold-tone metals are appearing in drawer pulls and lighting fixtures. As show here, they can be paired beautifully with nickel and chrome finishes and add great warmth among stainless steel, marble and tile. Open Shelving: If you like this trend, most quality cabinet manufacturer can create custom shelves to match the color and style of your cabinetry. 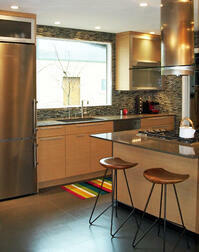 Most kitchen designers suggest open shelving be used sparingly. It's a big commitment to keep dishes as tidy as a photo stylist. Something to consider during the kitchen planning phase. 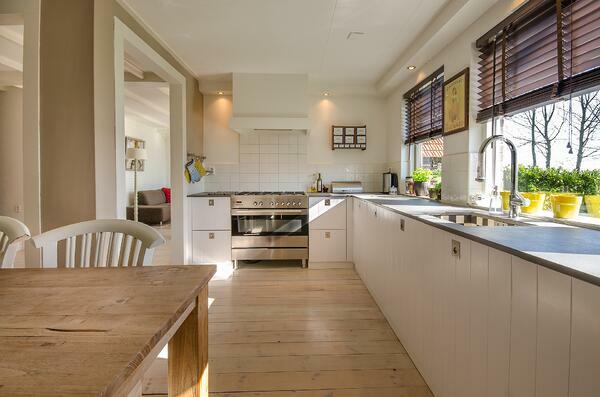 You're gaining momentum with your kitchen renovation project. Thanks to the collaborative efforts of your talented designer, you have a stunning kitchen plan in your hands. 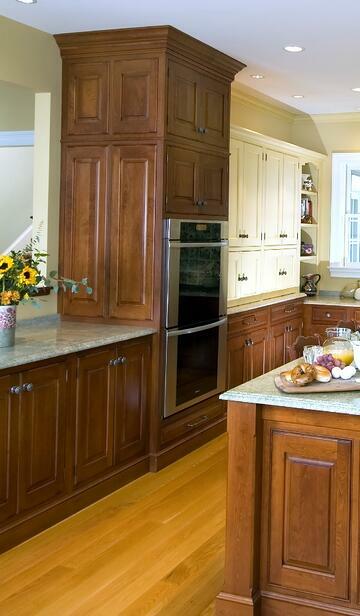 The next step is to choose the best kitchen company to supply and install your cabinetry. We have compiled a few essential questions to help you find the right kitchen design and installation company for your needs. Visit well-respected appliance, tile and stone suppliers, and ask who they themselves would use. How long has the kitchen company been in business? The entire kitchen design process is fraught with risk. A new company that promises the moon isn't worth much if they go under next month. Then what good is your warranty? 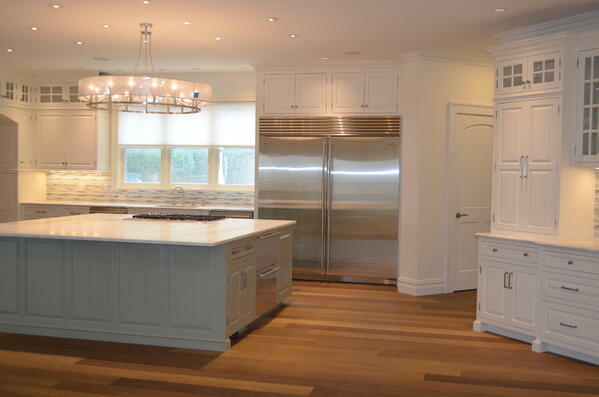 Ensure that a kitchen design company has been in business for a substantial length of time and that they will actually be able to honor their promise to tune-up their work. Personal references are a great way to determine the integrity and credibility of a kitchen design company, its owners and its employees. Is the company in question in good standing with the local Better Business Bureau and Department of Consumer Affairs? Does your court's small claims department have a wing in their honor? The internet makes it very easy to conduct background checks on contractors and companies for projects of this size. There are also many sites like Angie's List, Yelp and more that provide a feedback forum for savvy consumers. Ensure that you will be comfortable and safe having these people in your home, and around your family, for a significant amount of time. Choose a kitchen company that is concerned about your long-term satisfaction - not just your money. Establish their commitment to customer service. How long will they stand behind their work and their products? (Get everything in writing). Is their warranty up to industry standards? Ask for references and find out if they were treated professionally throughout the project - and afterwards when the warranty was tested. Are their kitchen cabinets made well? 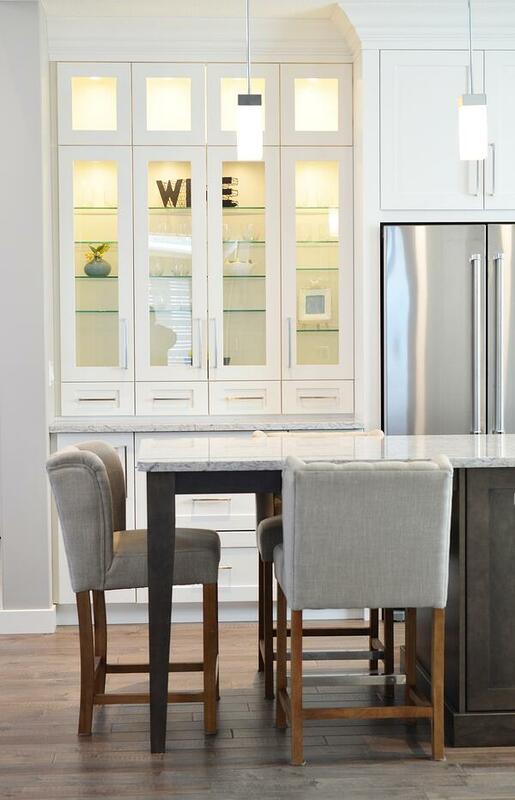 Know what to look for when you're shopping for kitchen cabinetry. You want to remain within your budget and honor your style but determine the value by checking out a few measures of quality. Are the drawers dovetailed? How thick are the door/drawer faces and inside panels? Are cabinet shelves adjustable and better yet, do they pull out? Slow close drawers are a wonderful feature. Are the door faces solid wood or composite? This section will be covered in a future blog but these features and more will be covered by your kitchen designer when you select a cabinet manufacturer. We wish you the best of success with your selection of a kitchen design and installation company. With a designer and kitchen company to provide guidance, let's talk next time about how to establish the right budget for your kitchen remodel.